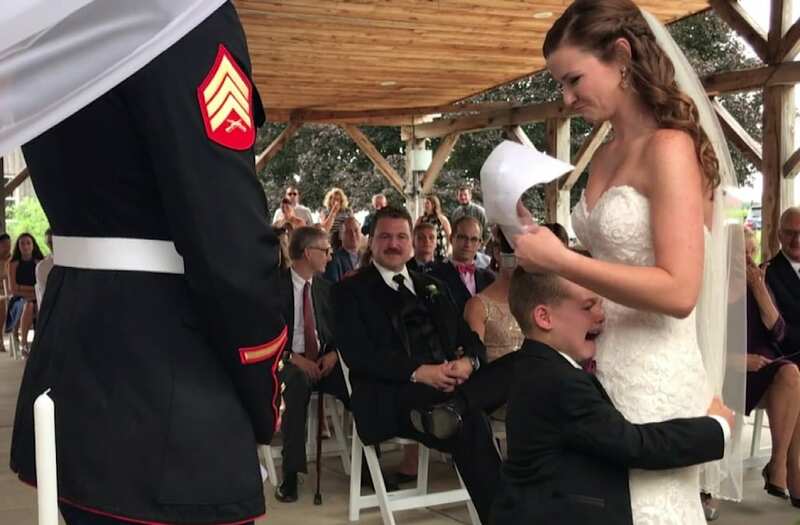 A stepmom read a heartwarming set of vows that she personally wrote for her new stepson, reducing the boy to tears during the ceremony. "I may not have given you the gift of life, but life surely gave me the gift of you," Emily Leehan read at the ceremony in Ripley, N.Y.
Senior Airman Leehan was marrying Marine Sergeant Joshua Newville when she recited the custom vows to her new stepson, Gage Newville. The moments were all captured on tape and Gage received a kiss as he tightly hugged the bride. "It's just been really an awesome experience to show the world how a blended family can work, and how you can make it a positive thing for your child," Leehan said. At the reception, Gage again stole the show, dancing up a storm. A photo of the happy family after the ceremony. Gage burst into tears as Leehan read the vows aloud, telling him he is "so extremely smart, handsome, and kind to others." "Don't cry, baby," Leehan said as an emotional Gage threw his arms around her. At the reception, Gage again stole the show, dancing up a storm while wearing a Darth Vader mask.